The Siberian Husky is a great family dog – not too large, active, and will put up with some rough play from children. A Husky’s natural behavior is to play, run, and be part of the “pack” – which will be your family. They are generally not aggressive at all and fit well in to families with kids of any age. Here are some things to think about before introducing a Husky (whether puppy or adult) in to your home, or before you bring a baby in to a home that already has a Husky. You no doubt already know that children need to be supervised around dogs. This means watching them at all times, not just a glance every other minute. The younger the child the more attention you need to pay. Kids and puppies are not aware of their size and strength and can hurt each other. Young kids might think pulling the tail of the dog is funny, but the dog might not think so! You are going to need to keep a close eye on both and be prepared to jump in and separate them should play get too rough or either starts to become agitated. Even if your kids are aged a little older, say early teens, the family pet is still ultimately the parent’s responsibility. After all, they are the ones buying the food, paying the vet bills, and often cleaning up afterwards! A family pet can help teach responsibility to kids, but it isn’t a substitute for good parenting. 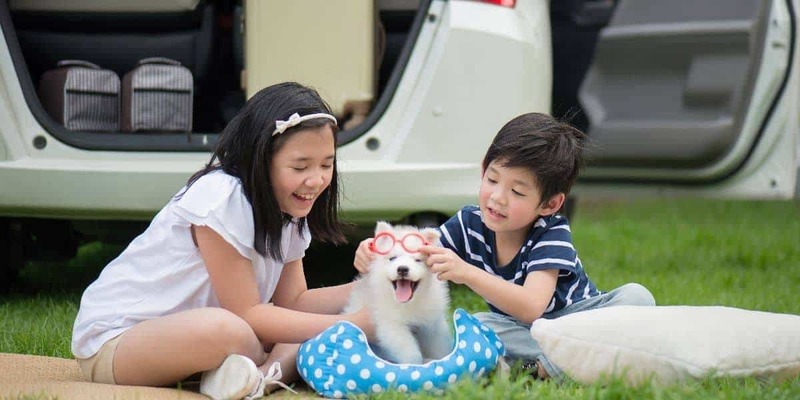 If your kids have problems with allergies (or even if they don’t) you might want to see how they go around other dogs, or even go and get an allergy test. Huskies can shed a lot of hair which could trigger sneezing or other hayfever-like reactions. While no dog is truly hypo-allergenic (free from allergic reaction), there are plenty of other breeds that are better suited if members of your family are sensitive to animals. Huskies need a fair bit of exercise to help them them becoming bored and destructive. Are you going to have time? 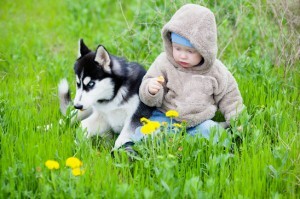 Especially if you have young kids that need a lot of attention, is your Husky going to get the exercise he or she needs? If introducing a new baby to a home that already has a Husky, you want to be aware of potential jealousy issues. The Husky might have already been the “baby” of the house and could soon find itself having substantially less attention paid to him or her. Weeks before the baby arrives you probably want to think about moving the Husky outdoors and away from constant attention. This will help the Husky get used to being alone a bit more, plus free up the house for all the “baby stuff” that is going to happen soon, including new furniture, playtime, visitors, sights and smells. Gradually you can introduce the Husky to the new family member and make acquaintances. For more information on introducing a Husky to a new baby you should check out this detailed article by the South Florida Siberian Husky Rescue organization. On the other hand perhaps you already have a young family and want to introduce a dog? The same principles apply. Take things slow, supervise constantly, and embrace the new family structure.